I must admit that I am, in my own words, a blue-collar practitioner of the Habits of Mind. I stumbled upon them purely by accident when they were still being called “intelligent behaviors” in a McRel publication. I had cut out the insert stating something like “intelligent behaviors are useful in the secondary and college classroom as well as in life” and created a, literally, cut and paste poster that I hung in my classroom. I researched “intelligent behaviors” and found some reading that indicated they were now being described as habits because it was desirable for them to be practiced so regularly that they became habitual. I purchased a copy of “Habits of Mind Across the Curriculum”. As I read, I immediately saw how useful these practices would be in the teaching of science. Perhaps the most important part of the scientific method is asking a question about an observation or occurrence; it is basic to the entire nature of the discipline. I introduced my 7 grade students to the HOMs in the following ways, but found that these methods could be adapted to any age group. I used some direct instruction about a particular habit and then created experiences where the habit could be practiced in a number of different ways. More and more habits could be integrated into the lessons as the students became more practiced. I have to admit that it seemed that the habits of mind had been tailor-made for teaching science! All sixteen had tremendous application in so many different instances, questioning and problem posing fit in almost all. I remember finding and reading an article “The Art of Powerful Questions” by Vogt, Brown and Isaacs. I developed age appropriate lessons from the content of the reading. Allow questions to direct your teaching to lead to some of the big ideas of science. And, honestly, a good session of “20 questions” would be great practice for any age. A strategy I learned at our district’s Marzano workshop is called “Talk a Mile a Minute”. It causes both students involved to use questioning as a basic process. The strategy involves two students working as a team, one is the receiver and one the sender. The students work by facing one another with one having a view of a vocabulary list or procedure description. The sender describes the words on the list to the receiver until they are successful in saying the terms on the list. Try it yourself, how would you describe these words to a person who cannot see the list? What questions would you ask? What questions might the other person ask you? This technique is self- motivating, infinitely adaptable and, perhaps most importantly, fun! I also had an interactive whiteboard where I could project a list I created and have students pair up to participate. Once the groups were finished I would question them about which terms were the most difficult and why that was the case. 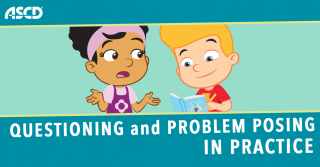 Questioning and problem posing is universal to all academic disciplines and just takes some practice to become proficient. Creating an environment where it is safe and fun to ask questions encourages students to become problem solvers in school and in life. Bob Feurer spent 37 years teaching 7-12 science and coaching three sports at North Bend Central P.S. in North Bend, NE. He retired from the classroom and has been elected to the local school board. He considers himself as a blue color habits of mind practitioner as he is self-taught after reading Habits of Mind Across the Curriculum and Learning and Leading with Habits of mind. He recently received his certification as a HOM professional developer. Feurer is a third-generation teacher and his daughter the fourth. He was the 2011 Nebraska Teacher of the Year.